A few months ago I visited the Digital Life expo in New York. I was there looking for digital media/digital home technologies to write about for PVR Wire. So as much as I wanted to spend all day playing with the video game previews, I tried to steer myself toward the folks like Digeo, One Voice, and Blip.tv. 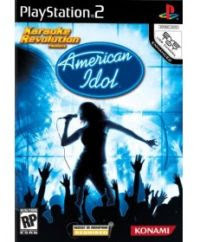 One game that did catch my eye though, was Karaoke Revolution: American Idol. As I mentioned the other day, we’re a big Karaoke Revolution household. We have the first four editions of the game for PS2 and have only skipped the country music edition, although I have to say I have been tempted to pick it up. I was dubious about the American Idol gimmick when I saw the game at Digital Life. I checked the song list and saw a few winners, but didn’t bother trying to play the game. And I think that was a mistake, because there are some noteworthy changes in the latest generation of the game. A friend brought it over last night for our Karaoke party. The first thing I noticed is that it takes a lot longer for the game to load various elements. This might be due to the fact that Konami keeps trying to cram something new into every iteration of the game. While Karaoke Revolution 3 added duets, and Karaoke Revolution Party added infinitely customizable characters, American Idol adds snarky comments from Simon Cowell. But when picking a character, the game is a lot less responsive than previous versions. As I press the button to change hair color from blond to brown, for example, the screen immediately says brown, but the character’s hair color doesn’t change for another second or two. I could probably forgive the developers if that was the only problem. But the game also takes longer to load scores after you’ve finished a song, and the menu selection screen (which has gotten more complicated with each version of the game) also takes longer to load. Add to that the fact that the characters seem more like robots when they dance than ever before, and the game would be a major step down, but for two points. I’m pretty happy with the song list. There are a few songs on the latest volume that I’ve always thought should be included in a Karaoke Revolution Game. These include “Stand By Me,” “Build Me Up Buttercup,” “Always Something There to Remind Me,” and a number of other great songs. While I stopped Watching American Idol on television 5 years ago, there’s no way to live in America without being conscious of the program. And there’s something kind of funny about hearing a panel of judges comment after each song. On the other hand, it’s a bit odd that Paula Abdul has been replaced in the game with some judge named Laura. She always seems to agree with Randy, and she doesn’t seem to be high. It’s just not the same. It’s also a bit odd, because one of the songs is “Straight Up,” and while I know Paula Abdul didn’t write the song, it seems strange that the song is on the disc when she wasn’t involved in making the game. It’s also quite clear that Randy, Simon, and Laura recorded a limited amount of dialog that gets mixed and matched into “unique” reviews for each performance. At one point, Simon Cowell said something to the effect of “That performance was weak. One of the worst singers of the night. At the beginning I just didn’t know where you were going with it, but I have one thing to add: It was fantastic.” The other strange thing is that you can get a great score from the video game and a horrible review from the judges. I’m going to blame this on the fact that we played at the easiest level. Perhaps the judges choose not to distinguish between levels of difficulty. While it’s great to have a new set of songs to sing, it feels like this game was rushed through production. The quality is just much lower than previous editions. And while it’s possible that I’ve become a much better singer, or that all of the songs are in my comfort range, I’m pretty sure the scoring is much more lenient than earlier versions. Overall, I’m happy with the game, and happy that Alan brought it over. But I’m not sure I’m ready to go out and spend $40 to pick up my own copy. Maybe when it hits the bargain bin later this year. In other news, I’ve changed my mind about iCon, the Steve Jobs biography. It’s not the best book I’ve ever read, and I still feel like the author’s a bit too adoring of his subject. But reading about Jobs and Woz’s early days reminds me of a much better book I read years ago, Hackers, by Steven Levy. I don’t think I have it anymore, but when I’m done with iCon, maybe I’ll hit up the local library and see if I can’t find a copy of Levy’s book.